3/14/2019–STATESVILLE, NC–On March 7, 2019, the Iredell Composite Squadron welcomed three new cadet officers at its annual Cadet Change of Command ceremony. C/2d Lt’s Ian Nettles, Joe Carbone, and Sarah Haynes made squadron history as the first time that three Billy Mitchell Awards have been presented at once. Capt Roger Ayscue, NC-162’s Deputy Commander for Cadets, was thrilled to see them reach this significant milestone in the cadet program. “We have never had three Mitchell promotions in one night,” he told the squadron. C/2d Lt Ian Nettles was featured in a previous article where he was recognized for volunteering over 1,000 community service hours. Since then, he has continued to live up to the Civil Air Patrol core values through giving another 260 volunteer service hours. The majority of these hours have been collected through his time as a volunteer fire fighter at Rowan County’s Cooleemee Volunteer Fire Department. In the squadron, C/2d Lt Nettles has been promoted to Cadet Emergency Services Officer, where he will assist in planning and executing ground team training exercises. C/2d Lt Joe Carbone had been studying for his Mitchell milestone test since October. He always stayed motivated and persistent, and he would like to encourage other NCOs to take the final step towards their officer rank. “My advice to cadets working to get their Mitchell is that you take your time and make sure you’re ready. Remember that once you accept this responsibility you will have the duty to lead your cadets safely, fairly, and with their best interests behind your decisions. Are you ready for the challenge?” C/2d Lt Carbone is also an active leader in Marine JROTC and is working on his application to the U.S. Air Force Academy. C/2d Lt Sarah Haynes is an avid photographer and journalist working to finish her Private Pilot’s License. She takes flight lessons each week, weather permitting, and has 20 flight hours out of the 40 necessary for her license. She is pushing to solo and obtain her PPL by the end of the summer, then continue on to instrumentation rating. 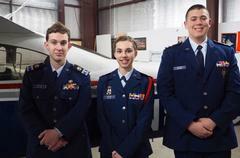 C/2d Lt Haynes is also the recipient of a four year technical scholarship for the Air Force ROTC. After the Billy Mitchell Promotions were completed, the cadet Change of Command ceremony commenced. NC-162’s outgoing cadet commander, C/Maj Jeb Ayscue, officially passed down his position to the incoming cadet commander, C/1st Lt Chandler Brown. The new First Sergeant, C/SMSgt Paul Mills III, ceremoniously passed the CAP flag between the two cadet officers and Lt Col Richard Rowan, the Deputy Commander for Seniors who stood in for the squadron commander. C/Maj Ayscue reflected on how much the squadron has grown since he joined the SAR Devils four years ago. He was proud that NC-162 had transformed from being “just an itty bitty part of the wing” to having their cadets staff or attend most wing events.